A weighted blanket is, as its name suggests, a heavy blanket. As we’re trying to cope with an ever increasing amount of stress in our lives, weighted blankets are gaining in popularity. 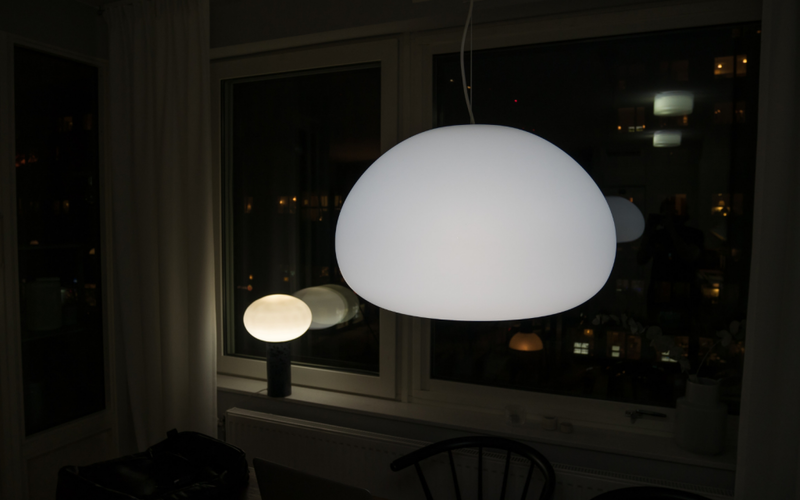 They help reduce anxieties or any worries and improve sleep. And of course, they’re always a more comfortable choice than the ordinary covers. Naturally, you learn to relax under the weight, fall asleep more quickly, and begin to love your blanket, so it becomes a natural, comforting sleep solution. Weighted blankets weigh anywhere from five to thirty pounds. As a rule of thumb, choose a weighted blanket that is 10 percent of your body weight. What if your weight is between the standard sizes of the weighted blankets? If that’s the case, experts typically recommend adding one or two pounds. But, ultimately, selecting the right weighted blanket is a matter of personal choice. The right structure also depends on your choice of temperature – whether cool (flannel), warm (cotton) or natural (quilt).The type of fabric is especially important if you are buying the blanket for someone who has sensory issues. 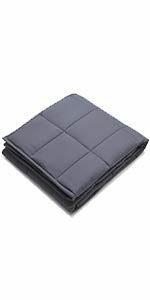 Weighted blankets come in various sizes, styles, and materials. Not all are suitable for everyone. In this guide, we’ll highlight the key features of some of the best-weighted blankets on the market. And accordingly, you can then make your pick. We all know how being an adult is hard. But that doesn’t mean that we also need to lose on good night sleep. The Quility Premium Adult Weighted Blanket doesn’t only make you sleep well, but it also leaves you feeling relaxed. It is made of 100% cotton and comes with premium removable polyester duvet cover and is fastened with eight strings along the side. So you don’t have to worry about the insert falling out of the cover. To ensure smoothness and comfort, they have evenly distributed premium glass beads, which are positioned inside small polyester pockets. The added two layers of microfiber prevent the glass beads from falling out and offer better temperature control. If you don’t know already, a weighted blanket should be about 10 percent of your body weight. The good news is, this weighted blanketoffer various sizes — a twin, queen, and king size —, and you can choose based on your needs. Furthermore, these blankets are entirely non-toxic, odorless, and hypo-allergenic. They are long-lasting and durable. After purchasing, if you aren’t satisfied, you can still return them with no questions asked and get your money back. If your kids are having trouble falling asleep, or you find them tossing and turning most of the time, it’s better to replace their regular blanket with a weighted one. In that case, we recommend YnM Weighted Blanket, as it works well. It has a seven-layer design that ensures maximum softness and provides all the comfort your body needs. Moreover, the use of more glass beads and less fiber offers better temperature control. You can use this both in summer and winter. But there is one drawback that could be quite disturbing. Users have often complained that the YNM Weighted Blanket rips around the seams easily, and you might wake up to glass beads all over the bed. This could be quite harmful to kids. Other than that, the glass beads stitched inside don’t move. Moreover, they also don’t make any noise while you sleep. And the blanket even spreads its weight equally around your body. This blanket offers ten different weight options so that you can choose accordingly. As with the previous blanket, the same rule applies here as well — weighted blankets for kids shouldn’t be more burdensome than 10% of their body weight. First things first, the material used in the making of CuteKing Cool Heavy Weighted Blanket matched our expectations for its price point. It is made up of 100% pure cotton, which is synonymous with a delicate balance between durability, breathability, and comfort. And then comes more cotton — the internal layer is also filled with it and other non-toxic materials. CuteKing uses glass beads instead of plastic pellets, which help in evenly distributing the weight on the blanket. It feels like a warm hug on your body. Also, the compartments of the blanketare sewed using the new technology to ensure no beads fall out, and thus, the blanket lasts longer too. You should note that they only offer large sizes, which means if you are looking for a weighted blanket for your child, it’s better to look elsewhere. But they are an excellent option for adults. What’s more, you can wash it in the washing machine, which makes it relatively easy to clean. 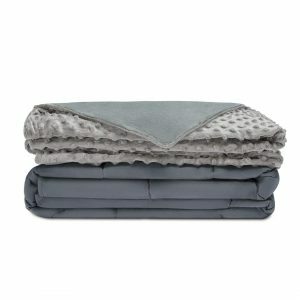 All in all, the CuteKing Cool Heavy Weighted Blanket is an incredible, low budget blanket that relieves stress and sends you into a deep sleep. We all are kids at heart. And even as adults, we can be picky about choosing colors. 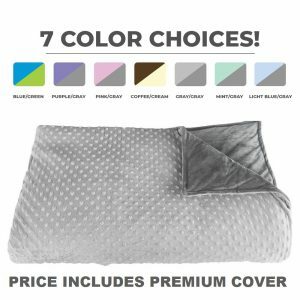 Lucky for you, Calmforter Premium Weighted Blankets have the best color range to choose. It comes in seven variations — pink, gray, purple, green, and more. Coming back to the quality, that isn’t a disappointment either. They have done a pretty good job with the material. One side of the cover is smooth as silk, and on the other hand, you’ll find a unique SensaDotTM texture pattern. Indeed, it’s a great tension releaser for fingers that like to fidget. Moreover, it comes in only one size — 60″ x 80″ — but big enough to cover you up completely. Many studies have shown that this size is ideal to provide full-body pressure therapy. It has excellent durability and is also easy to wash. The outer cover of the Calmforter can be quickly taken off for fast and easy washing and drying, using a zipper. 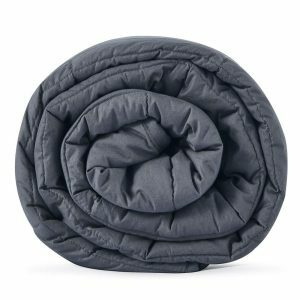 Overall, the Calmforter Premium Weighted Blanket is a perfect choice to get rid of unwanted anxiety and sleepless nights.